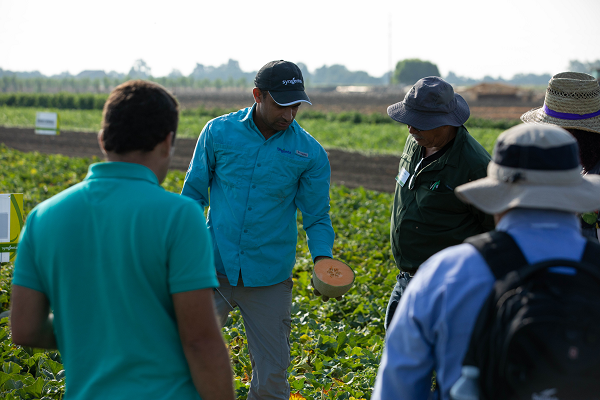 GREENSBORO, N.C., USA, August 20, 2018 – Attendees of the recent Syngenta Vegetable Seeds trial event in Woodland, California, had the opportunity to preview new and experimental varieties and observe their performance in the field. During the event, Syngenta representatives showed domestic and international growers and seed resellers how breeding advancements on display will address production challenges and meet market needs. Watermelon and melon innovations took center stage at the Woodland event, as this site is home to the Syngenta Global Cucurbits Center of Excellence. Research and development conducted at the Center of Excellence help Syngenta bring new offerings to market quickly. Sweet Spring – This Harper-type variety features a comprehensive resistance package on key melon diseases, including powdery mildew, Fusarium wilt and melon necrotic spot. It produces fruit with dark orange, firm flesh and a unique flavor profile. Sweet Sunrise – Another Harper-type variety, Sweet Sunrise is bred for resistance to cotton aphid to help protect yield and fruit quality. It produces larger fruit with firm, orange flesh and dense netting well-suited for shipping. Excursion – This early-maturing watermelon variety reaches maturity up to seven days earlier than other varieties, offering growers a first to market advantage. Excursion produces large, oval-shaped fruit with deep red flesh while offering improved resistance to Fusarium wilt race 1 and Anthracnose race 1. SP-7 – This Super Pollenizer™ variety delivers two times more early male blooms that are 25 percent larger than SP-6. It also provides pollen throughout the entire growing season with no competitive effect on the yield of seedless watermelon. For more information on Syngenta vegetables, visit www.SyngentaUS.com/vegetables. Join the conversation online – connect with Syngenta at www.SyngentaUS.com/social. ©2018 Syngenta, 410 Swing Road, Greensboro, NC 27409. Important: Always read and follow label instructions. Some products may not be registered for sale or use in all states or counties. Please check with your local extension service to ensure registration status. Super Pollenizer™ and the Syngenta logo are trademarks of a Syngenta Group Company.